Wireless Internet; PC; Mac; Adobe suite; Autodesk entertainment suite; Unity; UDK , etc. SCAD-Atlanta is excited to be a host site for GGJ 2012 in coordination with other member universities: Berklee College of Music, Columbus State University, Georgia Tech, Georgia State University, Georgia Gwinnett College, SAE Institute Atlanta, Southern Polytechnic State University, The Art Institute of Atlanta and University of Georgia (more to come). This jam site is open for the entire 48 hours. We will have several presentations and workshops offered by the local industry professionals before the jam on Friday Jan 27th 1-5pm. Registration is $20 payable at the door (CASH ONLY) which covers the cost of food, snacks and drinks for the weekend. Each participant will also receive an exclusively designed T-shirt (check out the attached image at the bottom of this page) and swag only available at SCAD-Atlanta jam site. 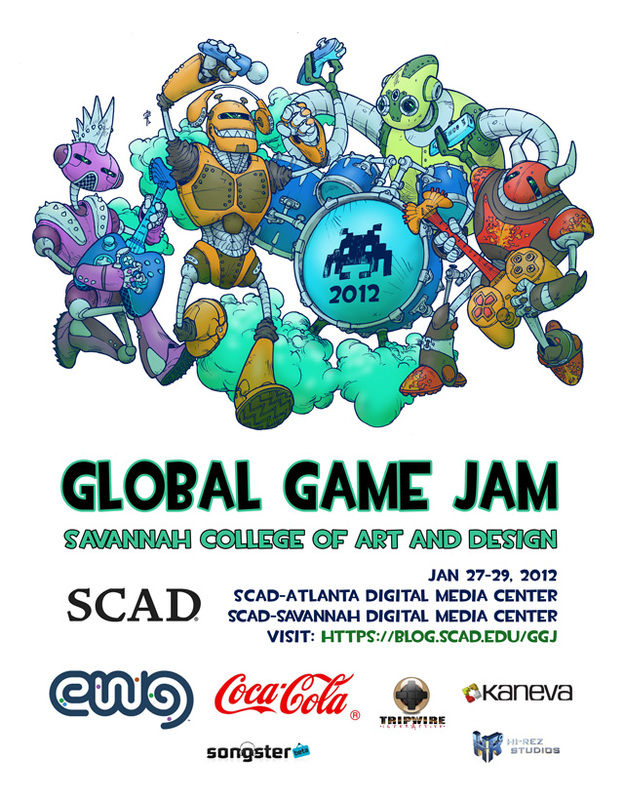 Special prizes will be awarded to the winners of this jam site (rules and conditions will be announced on the https://blog.scad.edu/ggj). All computers and software are in limited quantity. Participants are strongly encouraged to bringing their own laptops and equipments to work at the jam site. Wireless Internet connection will be available throughout the jam site.